Imagine a place in which everything is part of the same world—no need to make dividing lines between high and low art, between art and life, or between the world that you love in music and the world of work and love. Imagine this world laid out for you in paragraphs—interspersed with notes on the lives of rock stars, musicians, friends, ex-lovers and family members. And imagine that it were difficult to think of this as anything but what it is: then you are getting close to imagining what Andy Mister’s Liner Notes is all about. In his epigraphs to the book, Mister quotes Walter Pater, a famous romantic, as saying: “All art constantly aspires towards the condition of music.” This book is about finding that music, and it’s not just the lyricism of his essay/prose-poems that makes the book sing. He also writes about the lives of the famous, those who have been instrumental in shaping his life, thus creating a way of being sincere and present with the ghosts of the past just around the corner, all the time, as you read this book. This book’s main strength is that it wants to be honest, and there are intimations of this honesty throughout. There’s no way to lie, really, and the book is about the love of music and film and the pain and heartache of the landscape that a life is made of. In that sense, it might be somewhat romantic, but it’s more than that: I like to think of it as post-post-modern, as Mister says in his interview. It’s a book about what happens after irony and baseball games and play with words is gone, after the deconstructive is over. It reaches toward what a life might be made of, and it does so with sentences that are pulled through cultural filters to make it more vibrant and on fire with what Pater describes as art’s goal. There are lots of memories throughout the book. There are memories, too, that are other people’s memories—Nick Drake, Nico, David Lynch. In a sense, a book like Liner Notes levels the playing field, creating a landscape that takes everything in. There’s narrative here, but it’s not your typical narrative book, and the storylines are memories of childhood, youth, and other people’s lives. There’s pop culture, but there’s also a meditation on what music is, and in abstract language this is explored. It’s utterly sincere, but how does one measure that? On the back cover of Liner Notes, one reviewer/blurber hints at fire. I think, though, that Liner Notes is what happens after the fire has passed, after the world is somehow, as if for the first time, grown up with the narrator, and there’s an attempt to put pieces together to make a reading puzzle, with paragraphs that are both lyrical and abstractly intellectual. And narrative. In Liner Notes, Mister writes: Every day I wake up thinking, maybe I will do this for the rest of my life. After work, we make dinner, watch a movie then fall asleep. We dream we are sleeping next to each other. The book is, in an odd way, about a dream—a dream of the past, maybe. But the stories and narrative structure of the pieces gives it an edge that keeps you reading. There’s a sense in which every story that is told is part of the ghosts of the postmodern world. Seth Abramson, writing on The Huffington Post, called this the meta-modern. But this book ties together the lives of others with the lives of the narrator/writer and his family and friends, and in a way that makes it a cultural history of sorts. So perhaps there’s fire, there, after all. But it’s the kind of fire that has faded only to be remembered later on. There are turns of phrase in Liner Notes, too, that read lyrically: “Each argument blooms like wild asphalt, all we see for miles. Vision is impaired or implied.” The book isn’t too too lyrical though; it keeps itself from falling into the trap of becoming too pure of a song. There’s vision in this book, too, but it’s a looking-back kind of vision—our narrator makes sense of the past by reading it through the lens of the present, and we’re never sure if we’re hearing a young narrator or an older one. It’s the landscape of uncertainty that keeps this book moving along, because it’s not sure, and it’s a good seeker’s journey through this different sort of landscape—what will we discover next? And as we read through the text of the book, making secret discoveries along with the narrator, that “Everything happens to everyone,” or that “As you grow older, some things become clear while others become clouded.” We get good advice throughout the text, too, and the book is peppered with the abstract generalizing that makes it sink in. And the clincher is toward the end: “I never knew you could lie in a poem. Then I realized you couldn’t.” Here we have (essentially) what the storyline is about: in the post-modern, with its irony, we perhaps miss out on what the world is about. In the post-post-modern, with its newfound honesty, that doesn’t pretend to be hiding anything, we get some snippets of a landscape made fresh, yet not without its common ground for us to relate to. FANZINE: I really loved your book, and I’m struck by its relationship to the world of music—which, for many writers, is “separate” from the world of poetry. I find this own pull to music in my own writing, and I wonder: how did you become interested in the connections between poetry, or prose poetry, and sound? Have you read any books that you’d recommend to readers of the Fanzine, or any articles or anything that talks about the connection? 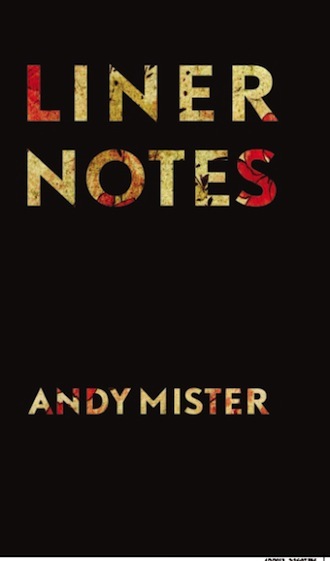 Andy Mister: A large part of my motivation in writing Liner Notes was to make the worlds of music and writing less separate. In my mid-to-late 20’s, when I was writing the book, music and literature were pretty much all I thought about, so to include music in my writing seemed natural. As far as books and essays, Lester Bangs’s writing is about the most poetic writing about music that I know of (and I quote him a few times in the book), also Ellen Willis’s music criticism was a big influence. There’s an essay by Jonathan Lethem called “The Beards” that begins with a description of Robert Fripp and Brian Eno’s alum No Pussyfooting. The reprint of Rick Moody’s first novel Garden State has an introduction by Moody in which he describes different periods of his life in relationship to certain songs by the New Jersey band The Feelies. I remember reading it in college and thinking I could write something like it. FZN: In your poem, one of them, you say: “The weather becomes the occasion.” This seems kind of like an epic sentiment to me, one that embraces the world rather than turning from it, or at least one that tries to take in what’s going on. Does this ring true to you? Are there any traces of the epic in your work, or do you see the book as more elegiac? (Forgive me if I’m making assumptions….). AM: I don’t really know. It’s weird because a lot of my life at that time involved hiding from the world, not embracing it. And part of the obsession with dead people or people you will never meet is a way to hide from life. But living in the Bay Area, it’s kind of hard to avoid the weather and how beautiful it is almost year-round, which can feel heightened when you’re really depressed in such beautiful surroundings. FZN: You talk in your book—a lot—about the lives and sad endings of rock stars, which is something that resonates with a lot of readers, I think, who love music. This makes me think about that old Hunter S. Thompson quote: “The music business is a cruel and shallow money trench, a long plastic hallway where thieves and pimps run free, and good men die like dogs. There’s also a negative side.” Does this quote resonate with you, too? AM: I’m not really too interested in the music business per se. But I’ve always been kind of obsessed with the lives of the people who created the things that I love. I felt like if I know about their lives then I could figure out the secret of how to make things like they did. I’m also interested in the mythology surrounding certain artists and how it can be used as a lens through which to view their work. And if you get caught up in it, that mythology can come to influence your own life—not always with good results. A lot of the book is about describing the mythology around self-destructive behavior but also undercutting it, trying to show the reality of it. FZN: You say, rather poignantly: “I never knew you could lie in a poem. Then I realized you couldn’t.” Is this part of the New Sincerity that a lot of folks have been talking about, that surfaced back around the middle of the last decade? There are people who say that lying in a poem is possible, but for me the truth, it seems, always gets out anyway. How do you approach sincerity as a goal or process? AM: I don’t really know. I think at the time I just thought that no one was ever going to read this stuff, so there was no reason to lie about myself or about the things I was doing to make myself look good. I also think that the stories we create around figures from pop culture are a sort of lie, but then they affect the way we live our own lives—for me at least—so that becomes truthful or real in a way. FZN: Your work’s been called postmodern, meta-modern, even. Do you feel that you want to embrace the social somehow, is that part of your goal? (This ties back in to the question about epic, about weather, I think.) How do you see yourself writing about the world, or is this something that’s not at the front of your mind as you work? AM: Honestly, I don’t really understand the term meta-modern, but if people want to think of my work in those terms, that’s fine. I feel like most of Liner Notes is about dealing with pop culture as just another part of one’s life, the same as the weather, or literature, or your family, or anything else that anyone cares about. That is, I guess, a post-post-modern stance, in a sense. Just accepting pop culture as another part of the landscape. There’s not even really a distinction between high/low culture it just all is. Liner Notes is forthcoming on October 15, 2013, and will be available through Small Press Distribution.